A. The character of natural soil deposits is influenced primarily by parent material and climate. The parent material is generally rock but may include partially indurated materials intermediate between soil and rock. Soils are the results of weathering, mechanical disintegration, and chemical decomposition of the parent material. The products of weathering may have the same composition as the parent material, or they may be new minerals that have resulted from the action of water, carbon dioxide, and organic acids with minerals comprising the parent material. profile that primarily affects the character of surface soils. C. The character of natural soil deposits usually is complex. A simplified classification of natural soil deposits based on methods of deposition is given in TABLE BELOW, together with pertinent engineering characteristics of each type. 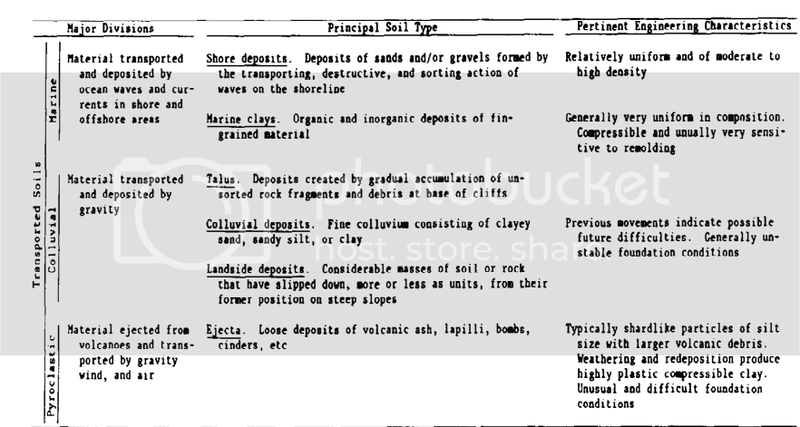 More complete descriptions of natural soil deposits are given in geology textbooks. 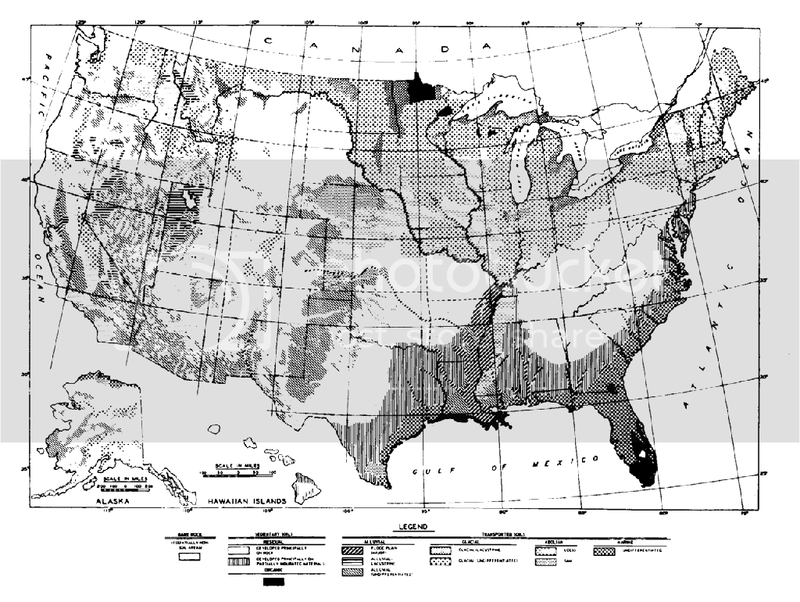 The highly generalized map in FIGURE BELOW shows the distribution of the more important natural soil deposits in the United States. density and consistency characteristics.- Coarse-grained soils have more than 50 percent by weight retained on the No. 200 sieve and are described primarily on the basis of grain size and density. With regard to grain-size distribution, these soils should be described as uniform, or well-graded; and, if in their natural state, as loose, medium, or dense. The shape of the grains and the presence of foreign materials, such as mica or organic matter, should be noted. index properties should be made in accordance with standard procedures. The grain-size distribution of soils is determined by means of sieves and/or a hydrometer analysis, and the results are expressed in the form of a cumulative semilog plot of percentage finer versus grain diameter. The knowledge of particle-size distribution is of particular importance when coarse-grained soils are involved. 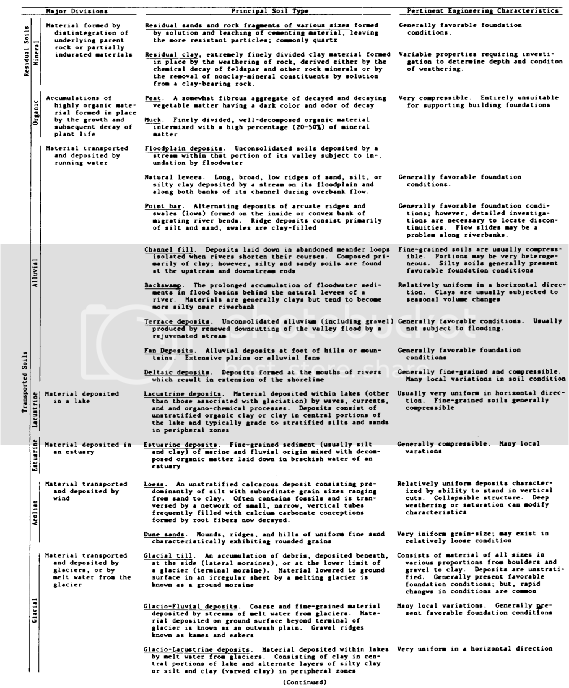 Useful values are the effective size, which is defined as the grain diameter corresponding to the 10 percent finer ordinate on the grain-size curve; the coefficient of uniformity, which is defined as the ratio of the D60 size to the D, , size; the coefficient of curvature, which is defined as the ratio of the square of the Do3 size to the product of the D1o and D60 sizes; and the 15 and 85 percent sizes, which are used in filter design. a low content of colloidal parti- cles have a correspondingly low LL. A decrease in LL and PL after either oven- or air-drying usually indicates presence of organic matter. The plasticity index (PI) is defined as the difference between the LL and PL. The liquidity index (LI) is defined as the natural water content wn, minus the PL, divided by the PI; i. e. , LI = (wn – PL)/PI. The LI is a measure of the consistency of the soils. Soft clays have an LI approaching 100 percent; whereas, stiff clays have an LI approaching zero. The activity, A, of a soil is defined as A = PI/(% < 0.002 mm). The activity is a useful parameter for correlating engineering properties of soil. The natural water content of a soil is defined as the weight of water in the soil expressed as a percentage of dry weight of solid matter present in the soil. The water content is based on the loss of water at an arbitrary drying temperature of 1050 to 1100C. volume of the soil and is usually expressed in pounds per cubic foot.